Street Law: Understanding Law and Legal Issues is an informative law-based text about people, government, law and community in America. Street Law students will develop a practical understanding of the U.S. legal system and prepare for active community participation in our diverse 21st century democracy by learning essential legal principles for daily living. 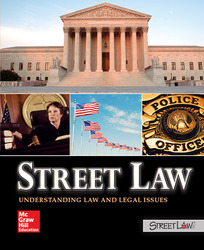 Street Law is a student text that also serves as a community guide to civic involvement by providing practical information about areas of the law that affect the daily lives of all Americans and U.S. residents. Particularly relevant are the areas of consumer, housing, family, and employment law, along with marriage, and parental rights. As students transition from living with their parents to living on their own or even starting their own families, basic awareness of Street Law subjects will become important in their lives to promote healthy inquiry about public policy and the law.